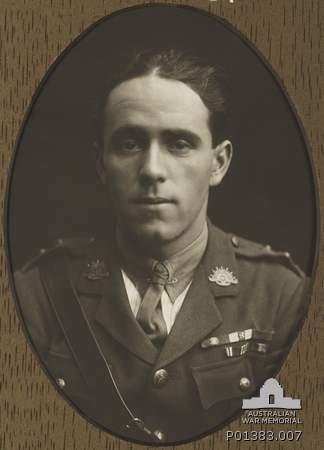 Lt. Joseph Maxwell (18th Battalion AIF - Service No. 607) was born in Sydney but was living at East Maitland and working as an apprentice boilermaker with J & A Brown at their Hexham workshop when he enlisted in early 1915. He is acclaimed to being the second most decorated soldier of the AIF during WW1 earning a Victoria Cross (VC), Distinguished Conduct Medal (DCM) and the Military Cross (MC) with bar (which means he was awarded it twice). Maxwell was also an “original” by which he was one of the first batches of Australians to enlist and serve at Gallipoli and then later fight in France. Just to have survived through both theatres was a feat in itself. In 1932 he wrote a book, ‘Hell’s Bells and Mademoiselles’, recalling his times during those years. After the war Maxwell lived, for a while, in the Hunter Region and died in Sydney in 1967 at the age of 71. Lt. Joseph Maxwell VC (607) 18 Battalion AIF - 1914 - 1918. Courtesy of the Australian War Memorial. 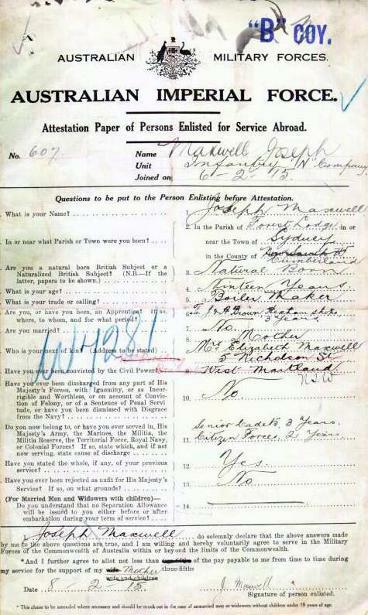 Joseph Maxwell's enlistment form, February 1915: Courtesy of the National Archives of Australia.